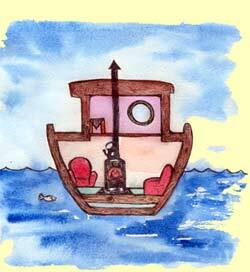 We have designed many stove installations for boats and barges. Some of the considerations for boat stoves are size & reliability. To some people the option of heating water and/or running a small radiator appeals. Morso Squirrel stove is quite a favourite with a lot of people looking for a stove for this sort of setting. The Morso Squirrel cleanheat is the ideal stove for a boat because it is efficient yet small. It is a top of the range cast iron stove. The Squirrel is available with a stainless steel back boiler that can easily heat hot water on a boat as well as power a radiator. As with other stoves you will have to consider the plinth of non-combustible material to place the stove on. The technical team will assist you to make sure your flue pipe is designed to fit your circumstances. We recommend a flue system where the outside part of the system is easily disconnected and stowed away and the flue stub is capped off during summer or when the boat is sailing. We carry a range of stove flue suited to fitting a stove into a boat including a suitable deck/cabin roof flashing (our 'square base flashing') that will seal to any roof or deck profile making a completely watertight seal between the deck and the flashing and between the flashing and the flue pipe. Other small stoves to consider for the smaller setting of a boat or caravan would be the Hunter Hawk stove, Small Arada stoves, Mendip stoves.